The Lone Bellow burst onto the scene with their self-titled debut in 2013. The Brooklyn-based band quickly became known for their transcendent harmonies, serious musicianship and raucous live performance — a reputation that earned them their rabid fan base. It's been three years since the band's victorious Then Came The Morning was released. Produced by The National's Aaron Dessner, the album was nominated for an Americana Music Award. The band appeared on "Jimmy Kimmel Live," "Late Show With David Letterman," "Conan O'Brien," "CBS This Morning," "Later...with Jools Holland," and "The Late Late Show With James Corden" in support of the album. In the years since the release, the band left their beloved adopted home of Brooklyn and moved to Nashville. 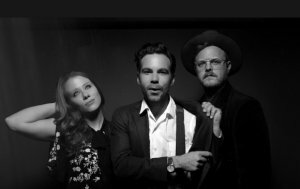 Now, The Lone Bellow is back with Walk Into A Storm, which will be released Sept. 15 on Sony Music Masterworks. Walk Into A Storm was produced by legendary music producer Dave Cobb (Chris Stapleton, Sturgill Simpson, and more) and features their lead single "Time's Always Leaving." The trio, featuring Zach Williams (guitar/vocals), Kanene Donehey Pipkin (multi-instrumentalist), and Brian Elmquist (guitar), recorded this album in only seven days. The group’s first two albums graced the Billboard 200. General Admission: $30. Service fees: $37. Service fees apply.